Within the medical industry, demand is rising for safe and halogen-free polymers used in manufacturing medical products. Many polymer companies are filling the need with new materials like thermoplastic elastomers (TPEs). For several decades, the medical industry has relied upon styrenic block copolymers (SBCs), a type of TPE, for use in a range of medical products. TPEs process easily, have excellent mechanical properties and elasticity, and possess strong haptics. Their inherent low toxicity and compliance to medical and food contact regulations make TPEs a safe choice for specifying materials for use. With more than 30 different types of TPEs with individual product properties, Kuraray offers a diverse portfolio for the medical market. These TPEs are safe and non-toxic, providing flexibility and performance in the design of medical products where superior performance and safety are needed most. Kuraray’s TPE products, Septon and Hybrar combine the elastic properties of rubber with the benefits of thermoplastics. Due to this thermoplastic nature, they can be processed into almost any shape. These TPEs have a soft touch and provide comfort and durability. Distinguished by their high clarity, non-allergenic characteristics and easy process-ability, Septon and Hybrar are perfect for applications such as medical tubes and pouches, orthopaedic gels, elastic non-wovens and films, patch adhesives and medical bags. As environmental standards increase, medical tubes are now being replaced with polymers such as Hybrar as a cost-effective solution for soft-touch applications. Due to its toughness, transparency, flexibility and physical properties, Hybrar meets many of the new characteristics needed for medical tubing. This TPE has excellent miscibility with polypropylene (PP) and has high affinity to polyolefins and styrenics, making it extremely transparent and easy to process. Hybrar blends with PP are soft, transparent, offer good kink resistance, have high-temperature performance and are solvent bondable. In comparison to PVC, Kuraray Hybrar has similar physical properties but lower density. Being halogen and phthalate-free, Hybrar meets many of the environmental and safety standards that PVC cannot meet. Moreover, compounds made out of Hybrar and PP have high tensile and excellent impact strength. The polymer structure of Hybrar also ensures relatively good oxygen and moisture permeability compared to other elastomers. Kuraray’s Septon is a series of high-performance, thermoplastic rubbers that are based on the company’s SEEPS technology. Styrene Ethylene Ethylene-Propylene Styrene (SEEPS) grades are comprised of copolymers with both isoprene and butadiene in the midblock. Two specific versions of Septon – Septon 4,000 series and Septon J series – can be used to create orthopaedic gels. The Septon J series and Septon 4000 series provide orthopaedic gels with stability and super soft characteristics giving the products a natural skin-like feel and performance over a broad temperature range. With their low specific gravity and high tear strength characteristics, these products can replace silicone in various applications. Additionally, characteristics like lower melt viscosity, excellent low temperature behavior and superior process-ability at a low shear rate ensure enhanced overall process-ability and production efficiency. such as cushions for artificial limbs, orthopaedic bandages, prostheses and burn plasters. Their excellent shock absorbing and damping properties combined with non-allergenic qualities meet the high demands in this industry. As elastic non-wovens and films continue to grow their presence in the market, so has the need to maintain optimal cost performance balance. Kuraray’s Septon 4000 series is designed for high-performing elasticity making it an excellent solution for many elastic non-wovens and films. For consumers, the main advantage is higher comfort and a decrease in creep resistance. These distinct properties lead to down-gauging probabilities. Also, significant material savings – as much as 40% lower material usage and 40% weight reduction over competitive products – can be achieved while maintaining mechanical properties, compared with other thermoplastic elastomers. Kuraray’s Septon 4000 series combines the strength of SEBS (styrene ethylene butylene styrene) elastomers with the softness expected of SBS (styrene butadiene styrene) and SIS (styrene isoprene styrene) elastomers. Various products within Kuraray’s Septon line can be processed for patch adhesives. The Septon 4000 series can be used when there is a need for products with extremely high cleanliness. Their well-balanced adhesion and cohesion force makes patch adhesives with Septon products easy to peel off. For the consumer, this reduces the risk of allergies. 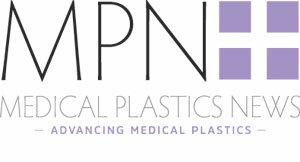 processes most often found in the manufacturing of medical bags. Both TPEs show maximum softness and elasticity. Due to their compatibility with polyolefins, they allow great flexibility to create film properties that normally cannot be achieved with commodity polyolefin resins alone. They perform well in high temperatures, can be sterilised and down-gauged due to their improved impact resistance. Furthermore, there is no migration of PVC plasticiser compared with PVC bags. polyolefin elastomers, these materials perform in the lowest concentrations necessary to achieve maximum value. The main advantage is impact resistance for down-gauging purposes. Specifically for PP, Hybrar can reduce the sealing initial temperature (SIT) up to 10 degrees. Medical applications today are becoming more demanding from both a performance and safety standpoint. This requires materials that go beyond standard SBCs that satisfy value-added solutions in a variety of processing technologies and end-use conditions. SBCs continued advancement in extrusion and injection-moulding process development further drive adoption into new application areas. Due to the concerns with PVC, SBCs offer a safer and more environmentally-friendly alternative with comparable performance. As the market continues to evolve, so will technology with new materials.